Credit Report: What’s on Your Credit History Report & Who Checks it? If you plan to participate meaningfully in the U.S. economy, it is vital to examine your credit report every year, and understand everything in it. A credit report is a detailed summary of your bill-paying history and the current status of your credit accounts. And, most importantly, how efficiently you paid those bills. Were you on-time with payments? Or, did you not pay at all? And possibly even an employer. They may weigh the various aspects of your credit history differently, but each one is hoping to answer the same question: if I give this person a loan or extend them credit, are they trustworthy enough to pay me back? What Is on a Credit Report? The short answer to that question is: A lot! The typical credit report will include personal identifying information: a list of credit accounts (including credit limit), type of account (credit card, mortgage, auto loan, etc. ), and your payment history on those accounts. The three major credit bureaus – Experian, Equifax and TransUnion – compile data from sources that extend you credit. Bits and pieces of your credit history may vary slightly among the three companies because not all businesses supply information to all three agencies. However, the broad picture of your credit history should be relatively consistent. Each credit report has four basic categories: identity, existing credit information, public records and recent inquiries. Identity: You are identified by name, date of birth, social security number, current and previous addresses, phone numbers and employment. Existing Credit Information: This includes detailed information about any credit accounts (credit cards, mortgages and loans) you have. Closed Accounts: Credit information about closed accounts remain on your credit report for 10 years. An exception is negative accounts, which are removed after 7 years. Payment History: The most important information is the payment history, which determines 35% of a FICO score. This is a two-year record of account statuses (paid/past due), missed payments stay on the report for seven years. Information about how much was owed and how late the payment was also is included. Public Records: This information is generated from transactions recorded by local, state and federal governments. It can include property purchases, liens, bankruptcies, foreclosures, court judgments and divorces. A completed Chapter 13 bankruptcy stays on your credit report for seven years; a completed Chapter 7 stays for a decade; criminal convictions may remain on it indefinitely. Credit Inquiries: This is a list of companies and individuals who requested a copy of the report in the past two years. Inquiries are listed as voluntary or involuntary depending on whether your actions created the inquiry. For example, a voluntary inquiry would be an application for a credit card. An involuntary inquiry would be if a lender pre-approved you for a credit card. Who Looks at Credit Reports? The Fair Credit Reporting Act (or FCRA) and some state laws attempt to restrict who can access your credit report and how that information can be used, but generally speaking, any business you seek credit from or anyone who has legitimate business need, can request to see your report. Lenders and potential lenders: The most obvious businesses would be banks, credit unions, mortgage companies, auto dealers, and credit card companies from whom you are seeking credit. Each one uses information from your credit report to determine how much credit to extend you and what interest rate to charge. Banks: If you open a checking or savings account, the bank is likely to check your credit to gauge your risk of over-drafting or abandoning an account. Landlords and Utility companies: Landlords, utility, cable and cell phone companies use the information to determine if you would be a reliable customer. Insurance Companies: Credit reports help insurance companies set their rates. Government Agencies: Eligibility for government benefits can be determined by credit reports. Judgment creditors and state or local child support enforcement agencies also have access. Collection Agencies: Debt collectors use account information to determine if you can pay the balance you owe. Employers or Prospective Employers: Companies need written permission from the employee or applicant to view a credit report. If you are denied a job because of a credit report, the company is required to provide an adverse action notice. This gives the reason you were denied as well as the credit report and which bureau it was from. One thing worth noting: by law, you have the right to know who has inquired about or requested your credit report in the last six months. When you request a copy of your report, a list of all businesses or individuals should be on it. The Fair Credit Reporting Act requires Experian, Equifax and TransUnion to provide you a free copy of your credit report once, every 12 months. There is a charge for credit scores, but the credit report is free. To get a free credit report, go online to www.annualcreditreport.com or call 1-877-322-8228 and request it. This is the only website authorized to fill orders for free credit reports. Once there, each agency must supply you one credit report every 12 months. You could receive all three reports at once, or spread them out over 12 months — depending on the purpose you have. If you want to examine the three together and compare all the information contained in each report to be sure it’s accurate (e.g. spelling of name, address, businesses you have credit accounts with, amount owed to each creditor, etc. ), you should request all three at the same time. Since the information on all three should essentially be the same, you may want to ask for one report every four months and verify each time that the information remains accurate. If you already received a free report from each of the bureaus and want to check your credit report again, you can contact any of the three reporting agencies and order one for a small charge, usually under $10. Be aware that there are several websites with very similar names and spellings that advertise “free credit reports” but it’s a ruse. The www.annualcreditreport.com site is the only one authorized to provide free reports. The others will send you a report only after you have paid a fee for other services. Be careful to visit the correct website and do not allow them to charge you anything for a report. Anytime you are considering a major purchase that will require a loan, such as a home mortgage, car loan or home improvement project, you should start by requesting and reviewing your credit report. The interest rate you receive from any lender is based on your credit score and the information contained in your credit report. If there are mistakes, it could affect the interest rate you receive and cost you thousands of dollars. A recent government survey says that 20% of consumers found at least one error on their credit report that makes them look riskier than they are. That’s one reason it’s so important to check your credit report regularly. Another is to see if you are the victim of identity theft. A survey from Javelin Strategy and Research says that a record 16.7 million Americans were victims of identity theft in 2017, resulting in $16.8 billion stolen. Over 5.5 million were victims of credit card fraud and about two million were victims of bank fraud. Applying for a job is another reason to review your credit report. A study by the Society of Human Resource Management said that 47% of employers look at a candidate’s credit report. If there is incorrect information there, it could impact your hiring. When you apply for credit of any kind, you effectively authorize a business or individual to do what is called a “hard pull” or “hard inquiry” on your credit report. There likely will be a negative effect on your credit score from hard pulls, especially if several occur over a short period of time. By contrast, some businesses do “soft pulls” on your credit report and there is no effect at all on your credit score. This usually occurs when a company is shopping for new customers and offering incentives like low-interest credit cards or loans. They want to know if you’re a good prospect for their offer so they’ll do a “soft pull” on your credit report and you probably won’t even know it happened. Hard pulls are another issue. Hard pulls are viewed as an indication that you need financial help to complete whatever transaction you are making, thus it has a negative effect on your credit score. The effect usually is slight, maybe 5-to-7 points, but if your credit score is on the borderline, it may drop to the wrong side of that line after a hard pull and affect the interest rate you are charged. This should not discourage you from shopping at several lenders for auto or home loans. Fair Isaac Corporation (or FICO) calls this “rate shopping,” and allows a 45-day window where the numerous hard inquiries are treated as just one. Each credit reporting bureau reports whatever data is sent to them. Some companies do not report to every agency, which may create inconsistencies among your three credit reports. Minor inconsistencies should not have much effect on your credit report or credit score. In general, the same credit history will be shown on all three reports. 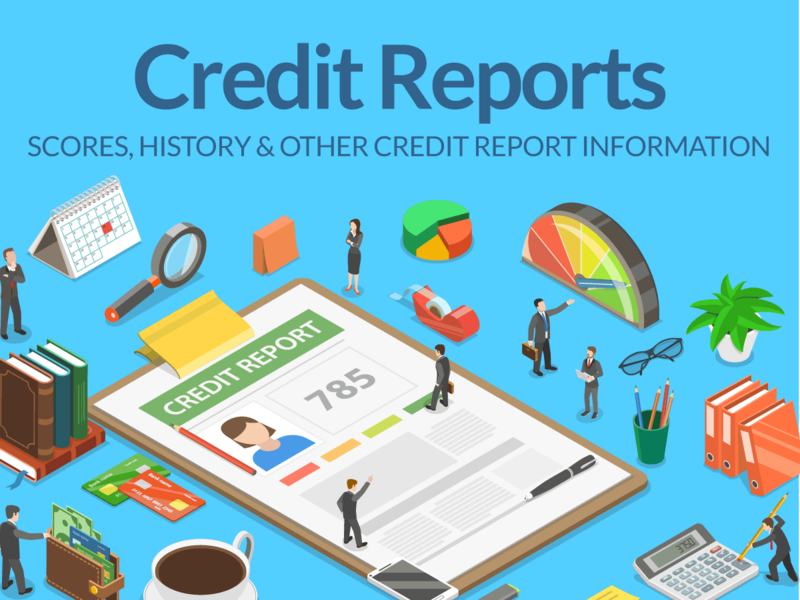 All your credit reports have the same basic sections for your identifying information, public record history, existing credit information and payment history, and recent requests for your credit report. The three major bureaus also help determine your credit score by the information they feed to FICO, which produces the FICO score that is the benchmark credit score for 90% of all businesses. Despite consistent credit reports, you may still have three different credit scores. Each bureau uses a different formula for gathering the data it supplies to FICO. Industry analysts say the algorithms involved are so complicated that it’s impossible to determine what specific pieces of information created the different score. The same industry experts suggest that people who want to improve their credit score should focus their attention instead on the five risk factors that determine a credit score: payment history, amount owed, length of credit history, credit mix, and new credit. While credit bureaus make every effort to report accurate and up-to-date information, your reports may have misinformation and are subject to human error. If you notice wrong information in any one of your credit reports, you can start a dispute with the credit bureau that made the error. Recent court rulings prompted all three reporting bureaus to promise they would expand their investigation departments and act more promptly and professionally when an error is in dispute. When you start a dispute, contact the company you believe supplied the inaccurate data and the credit bureau that reported the error. For example, if you notice that your Equifax report has an error about your credit card payments, contact both Equifax and the credit card company. To contact the credit bureau, follow the instructions listed on your credit report, or visit the bureau’s dispute page. The best way to contact the business that reported an error is to write a letter and send it to the address listed on your last bill or statement. When contacting the business and the reporting bureau, you’ll need to give identifying information like your name, address, and account number. Identify each item you dispute, explain your position, and request that the items be deleted or corrected. Provide copies of documents that support your claim, such as credit card statements or court documents, and include a copy of your credit report with the disputed items circled or highlighted. The credit reporting agency must contact your creditor within 30 to 45 days after you file a dispute. If your creditor cannot find a record of the information in question, the credit bureau will delete it from your report. If the credit bureau finds that the information is incomplete or inaccurate, it will delete wrong information and add missing information. In this case, the credit bureau typically mails you an updated copy of your report. Once your report is updated, the agency should send the new information to the other two national credit reporting agencies. However, it is up to you to confirm that all three of your credit reports are accurate. At your request, the agency can also send a notice of correction to any creditor that viewed your report in the last six months. Your credit report is a brief history of your debts and credit accounts, as well as relevant data like bankruptcy information. Your credit score, on the other hand, is a number ranging from 300 to 850. It provides no context or background information but it quickly summarizes your credit standing. A higher score reflects a better credit history, showing lenders you are a good investment and are most likely make payments on time. While you can obtain a free annual copy of your credit report, you typically have to pay for your credit score.